This is an oil-free, low-fat recipe, but you can substitute your favorite baking oil (a few tablespoons) for the water if you prefer a crisper bite. 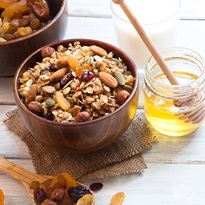 In a large bowl, stir together the oats, oat bran, wheat flakes, wheat germ or flaxseed, almonds, raisins, and chopped dried fruit. In a small bowl, whisk together the honey, water, and vanilla. Add the wet ingredients to the dry ingredients and stir to thoroughly combine. Spread the granola out in a 13x9-inch baking dish.